Krill are marine crustaceans that look like small prawns. Scientifically speaking, they belong to the Euphausia genus. Quite often, Euphausia superba (or Antarctic krill), is the preferred species used to make krill oil, a supplement that has recently gained attention as a superior alternative to good old fashioned fish oil. 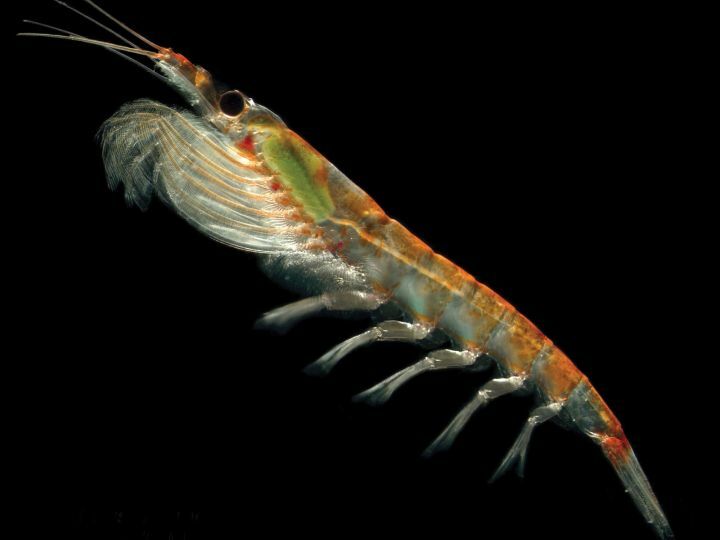 It should be no surprise that the Atlantic Krill live in the Atlantic Ocean (or the Southern Ocean), which is the ocean that surrounds Antarctica. Krill from the Atlantic are harvested for manufacturing krill oil and to be used in aquaculture. Krill oil is made up of three major nutritional componentsl. Firstly, krill oil contains high amounts of of omega 3 fatty acids, much like that found in fish oil. Any benefits of fish oil would also apply to krill oil. However, krill oil also contains additional components such as omega 3 phospholipids and astaxanthin (a type of antioxidant). Neither of these are present in fish oil. There is some evidence to suggest that omega 3 fatty acids may have anabolic properties, helping to increase muscle strength, and is therefore beneficial for bodybuilding (please refer to our “Omega 3 Benefits for Bodybuilding” article). In addition, omega 3s fatty acids are also beneficial for recovery and joint support because of their have anti-inflammatory effects. The antioxidants in krill oil are beneficial for helping to increase recovery as well as improve general health, thanks to its ability to reduce reactive oxygen species buildup during exercise and stressful times. Some studies have compared the effects of fish oil and krill oil. When krill oil is given at a dose lower or equal to fish oil, it was found that krill oil was superior in its ability to improve blood glucose, triglycerides, and cholesterol (Bunea et al, 2004). In other words, gram for gram, krill oil appears to be better for treating cardiovascular disease compared to fish oil. This is most likely a result of the way the omega 3 fatty acids are bound. Unlike in fish oil, krill oil contains omega 3s in free form and phospholipid form, as opposed to triglyceride and ester forms, which may be less well absorbed. For a more detailed comparison between krill and fish oil, please refer to our Krill Oil vs Fish Oil article. Some women suffer from premenstrual syndrome (PMS) before menstruation. Symptoms may be emotional, as well as painful cramping. These symptoms can be severe and can a major nuisance. There is evidence to show that krill oil can be very effective in treatmenting PMS symptoms such as pain and emotional upsets. In addition, its effects appeared to be superior to that of the same amount of fish oil (Sampalis et al, 2003). One aspect to consider before buying krill oil is its price. By weight, krill oil is far more expensive than fish oil. So you would need to do the maths to see if it is worth buying a product that is essentially a concentrated form of fish oil. When taken at sensible doses, krill is safe and is generally well tolerated. Krill oil has the added benefit of being less likely to cause reflux and gastrointestinal problems compared to fish oil. However, krill oil may cause oiliness of the skin in some people (Sampalis et al, 2003). The above mentioned studies have found that 1 g of krill oil was effective in improving PMS symptoms and lowering cholesterol. The recommended dosage is therefore approximately 1g/day. In most cases, krill oil supplements are available in lower doses compared to fish oil capsules (under 1 g). Lower dose capsules can therefore be taken throughout the day with meals to make up a total of 1 g.
Pure krill oil are often found in capsule form. Because krill oil is anti-inflammatory, it can also be found in some of the better joint support supplements. Neptune krill oil (or NKO) is a patented brand of krill oil that has been the subject of many scientific studies. It is therefore the recommended form of krill oil and it can be found in good krill oil supplements. Simply look on the packaging to find if your krill oil is NKO. Because krill can be quite expensive, some people use a blend of krill oil and fish oil together. This is a cost effective way to get the benefits of krill oil such as the additional antioxidant properties of astaxanthin, with the economy of fish oil. In addition to this, krill oil makes a fine companion for pretty much any other supplement that you are already taking.